Whohoo! Our new and improved Beyond Clean Cleanser has replaced Firming DMAE Cleanser. Beyond Clean Cleanser is rich in superior, age-defying antioxidants such as nutrient-rich sea kelp for skin. Our sea kelp bioferment is one of tje best on the market, becasue it’s non-oily so it’s perfect for all skin types. And because it’s combined with inflammatory zinc, and skin exfoliating blemish buster – salicylic acid, it not only removes all traces of makeup, it can help decrease redness and prevent blemishes – without drying the skin. This premium grade cleanser is another one of our popular paraben-free skin care products that is also cruelty-free and free of harsh, unhealthy ingredients. 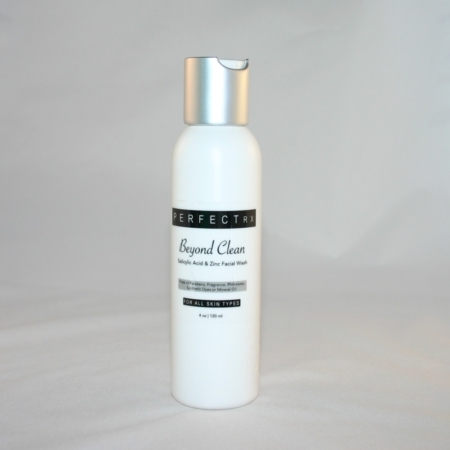 Firming DMAE Cleanser has been replaced with Beyond Clean Cleanser 4 oz. Directions: Cleanse skin morning and evening with Beyond Clean Cleanser. Rinse skin with tepid water. Follow with our new, Soothing Skin Toner made with age-defying sea kelp bioferment, collagen, Astaxanthin and hyaluronic acid. Ingredients: See a complete list of ingredients on the Beyond Clean Cleanser page.